We conducted a follow-up study of Epstein-Barr virus (EBV)-associated Hodgkin’s Lymphoma (HL) in a patient with rheumatoid arthritis (RA) in whom a drastic complete remission (CR) was achieved after withdrawing methotrexate (MTX) together with administration of clarithromycin (CAM). CAM was administered for 1 year after the first admission but typical HL relapsed 4 months after suspending CAM treatment. The relapse was successfully treated with standard chemotherapy and led to CR. After achieving CR, treatment of CAM coupled with low-dose prednisolone (PSL) was restarted as a maintenance therapy. This combination treatment was found to be effective for preventing the relapse as well as controlling RA. Neither MTX nor other anti-rheumatic drugs except for PSL have been used since initial presentation. To date, no relapse has occurred and RA symptoms are fairly well controlled. Clinical parameters for EBV, RA and HL and circulating cytokines during the course of illness showed elevated levels of soluble interleukin-2 receptors, interleukin (IL)-1β, IL-6 and tumor necrosis factor-α in initial phase of the disease as well as in relapse phase, and returned to normal in CR phase. Copies of EBV-DNA in circulating lymphocytes were increased in relapse phase but returned to normal in CR phase. Since relapse occurred without MTX, this drug is thought not to have caused the HL. Rather, immunodeficiency due to RA itself or PSL (more than 10mg/day) administration might have resulted in reactivation of EBV, leading to HL. Immunomodulatory and immunosuppressive effects of CAM coupled with low-dose PSL on cytokine networks might be involved in maintaining CR and controlling RA. This combination treatment is recommended as a maintenance treatment from the perspective of simplicity, safety and cost-effectiveness in such a situation. We conducted a follow-up study of Epstein-Barr virus (EBV)- associated Hodgkin’s lymphoma (HL) in a patient with rheumatoid arthritis (RA) in whom a drastic complete remission (CR) was achieved after withdrawing methotrexate (MTX) together with administration of clarithromycin (CAM). RA patients have an increased risk of developing lymphoma [1,2]. Since Ellman’s first report  on lymphoma in a patient with RA who received longterm, low-dose MTX, a relationship between MTX medication and development of lymphoproliferative disorders (LPDs) in RA has been emphasized [4-7]. Kamel et al. first reported that two patients taking MTX for rheumatologic disease, who developed lymphoma, were associated with Epstein-Barr virus (EBV) infection, and a spontaneous regression occurred after withdrawal of MTX. There seems to be a close relationship between long-term use of MTX and development of EBVassociated LPDs. In this case, a relapse occurred without MTX after achieving the first CR. This indicates that MTX is not a direct causative agent and other possibilities should be considered. Clarithromycin (CAM), a member of macrolide family, is a widely used antibacterial drug. It is also known to have multifunctional effects such as immunosuppression, immunomodulation [9,10], apoptosis-induction [11-13] and steroid sparing/enhancing effects [14,15]. In the present case, the first CR was achieved after withdrawing MTX together with administration of CAM. CAM was administered for about 1 year without anti-rheumatic drugs except for prednisolone (PSL). However, a recurrence occurred 4 months after suspending CAM treatment. This fact seems to indicate that CAM might have played an important role for preventing relapse of HL. The relapse was successfully treated with standard chemotherapy. After achieving the second CR, the treatment consisting of CAM and low-dose PSL (initially, 10 mg/day, then reducing to 5 mg/day) was conducted. By this treatment, we were able to prevent the relapse of HL as well as to control RA. Thus far, there are only two reports including our previous one [16,17] which documented effectiveness of CAM as an adjuvant drug for treating HL. In the present case, we analyzed the clinical course with special reference to parameters for EBV, RA and HL and circulating cytokines. Our reports including a previous one  can provide valuable information on the mechanism of developing EBV EBVassociated HL, relationship between HL and RA, and effective treatment both for preventing relapse of HL and controlling RA by a simplified treatment with CAM coupled with low-dose PSL. A 60-year-old woman (body weight:51kg) with a 10-year history of seropositive RA was admitted to Imai Hospital on March 12, 2011 because of an intermittent high fever lasting for 3 months, early satiety, anorexia, weight loss, joint pains and left cervical swelling. For approximately 10 years before initial presentation, she had been treated with several drugs including MTX, PSL, salazosulfapyridine, bucillamine and non-steroidal anti-inflammatory drugs in another hospital. Particularly, MTX (at weekly doses of 2 mg, then gradually increased to 8mg) was administered for approximately 6 years before admission. Her clinical course from the first admission to subsequent followup in an outpatient basis before relapse (Figure 1) was reported previously . Briefly, the patient was diagnosed as having MTX-related EBV-associated Hodgkin-like lymphoma [17,18], and a drastic CR was achieved after withdrawing MTX together with an oral administration of CAM. In this case, treatment with PSL (20 mg/day, then reduced to 10mg/day) was restarted 2 months after achieving CR (early July, 2011) because of the exaggeration of generalized joint pains and swellings. The PSL treatment was effective for subsiding the symptoms. However, levels of solubleinterleukin- 2 receptors (s-IL-2R) gradually started to increase one year after achieving CR, suggesting a relapse. Figure 1: Clinical course before the relapse. Activity of HL is reflected by the levels of s-IL-2R. Relapse occurred 4 months after suspending CAM. RA symptoms were fairly well controlled by PSL administration, but exaggerated with relapse of HL. EBV-DNA in circulating lymphocytes increased during the relapse.↑, slight increase; ↑↑, apparent increase. Abbreviations: Anti-CCP, anti-cyclic citrullinated peptide antibody; CAM, clarithromycin; EBNA, Epstein-Barr virus (EBV)-determined nuclear antigen; EBV-DNA, EBV DNA in circulating lymphocytes; E-VCA-G/M, EBV viral capsid antigen immunoglobulin G/M; HL, Hodgkin’s lymphoma; MMP, matrix metalloproteinase; PSL, prednisolone; RA, rheumatoid arthritis; RAPA, RA particle agglutination; s-IL-2R, soluble IL-2 receptors. The patient was readmitted on October 5, 2012. On readmission, the metacarpal and pharyngeal joints of both hands and bilateral knee and ankle joints were swollen with moderate tenderness. A complete blood cell count revealed red blood cell count of 4.55×1012/L; hemoglobin 12.7 g/dL, white blood cell count of 5.3×109/L with 71.0% neutrophils, 20.3% lymphocytes, 7.0% monocytes, 1.3% eosinophils, 0.4% basophils and normal platelet count (313×109/L). Elevated levels of CRP (1.68 mg/dL; normal range [nr]. 0~0.26 mg/dL), β2-microglobulin (2.3 mg/L; nr. 0.9~1.9 mg/L), s-IL-2R (987 IU/mL; nr. 124~466 IU/mL), RA particle agglutination (RAPA) (×320; nr. <×40), anti-cyclic citrullinated peptide (anti-CCP) antibody (242 U/mL; nr. <4.5 U/mL), matrix metalloproteinase (MMP)-3 (82.0 ng/mL; nr. 17.3~59.7 ng/mL) and IgA (455mg/dL; nr. 110~410 mg/dL) were elevated. Titers of EB virus antibodies were elevated in viral capsid antigen (VCA)-IgG (×320; nr. <×10), and EBV-determined nuclear antigen (EBNA) (×40; nr. <×10) with VCA-IgM level less than ×10. Copies of EBV-DNA in circulating lymphocytes were elevated (61 copies/ μg; nr. <10 copies/μg). Thus, an oral administration of CAM (400 mg/ day, 200 mg twice a day) was reapplied in mid-October, 2012 with expectation of CR as before. However, it was suspended two months later because of further elevation of s-IL-2R and a complication of acute pancreatitis (Figure 2). Figure 2: Clinical course after the relapse. 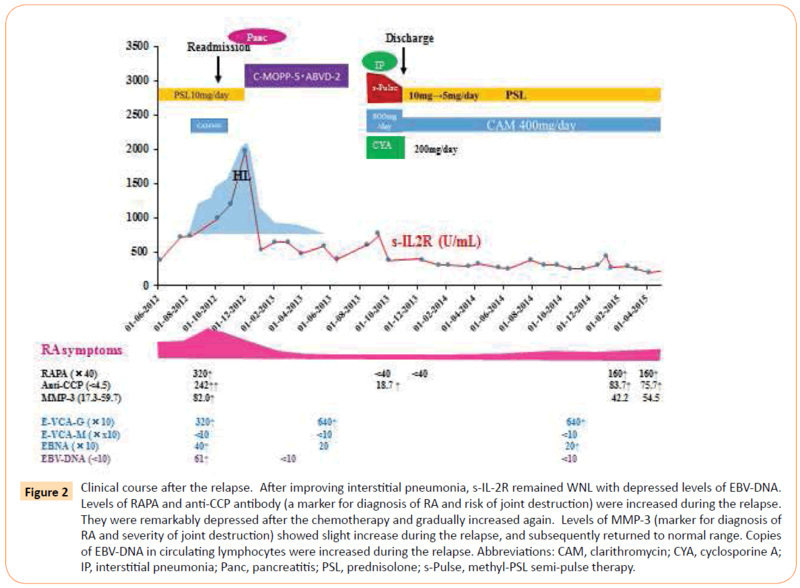 After improving interstitial pneumonia, s-IL-2R remained WNL with depressed levels of EBV-DNA. Levels of RAPA and anti-CCP antibody (a marker for diagnosis of RA and risk of joint destruction) were increased during the relapse. They were remarkably depressed after the chemotherapy and gradually increased again. Levels of MMP-3 (marker for diagnosis of RA and severity of joint destruction) showed slight increase during the relapse, and subsequently returned to normal range. Copies of EBV-DNA in circulating lymphocytes were increased during the relapse. Abbreviations: CAM, clarithromycin; CYA, cyclosporine A; IP, interstitial pneumonia; Panc, pancreatitis; PSL, prednisolone; s-Pulse, methyl-PSL semi-pulse therapy. A combined positron emission tomography/computed tomography (PET/CT) scan carried out in early December, 2012 showed notable 18F-Fluorodeoxyglucose (FDG)-uptake in supraclavicular, mediastinal, hilar, peri-pancreatic, para-aortic, iliac and inguinal lymph nodes and left eighth rib, indicating full relapse (Figure 3). A subcutaneous lymph node which appeared in left lower abdominal wall was biopsied, and it showed the infiltration of Hodgkin (H) cells with remarkable nucleoli and Reed-Sternberg (RS) cells in the background of small lymphocytes (predominant CD4-positive cells and occasional CD8-and CD-20 positive cells). H-RS cells were immunohistochemically positive for CD30, latent membrane protein-1 (LMP-1) and Ki-67, but negative for CD20, CD21 (not shown) and CD15 (not shown). In situ hybridization (ISH) revealed the presence of EBV-encoded small RNAs (EBER) in these cells (Figure 4). Thus, a diagnosis of EBV-associated HL (mixed cellularity) was made. Neither immunoglobulin heavy chain gene (i.e., JH) nor T-cell receptor chain gene (i.e., TCRCβ1) was demonstrated by Southern blot hybridization analysis of the lymph node (not shown). C-MOPP (cyclophosphamide, vincristine, procarbazine and PSL) therapy at every 4-week intervals was initiated in mid-December, 2012. This regiment was effective and systemic lymph node swellings almost disappeared. After finishing 5 cycles of C-MOPP therapy, 2 cycles of ABVD (doxorubicin, bleomycin, vinblastine and dacarbazine) therapy were added as a consolidation therapy. However, after finishing 2 cycles of ABVD therapy, severe interstitial pneumonia due to bleomycin developed in early August, 2013, but this was improved by methyl-PSL (m-PSL) semi-pulse therapy (500 mg/ day for 3 days with gradual reduction doses) combined with an oral administration of CAM (800 mg/day) and cyclosporine (200 mg/day) (Figure 2). After suspending the semi-pulse therapy, PSL (10mg/day) was alternatively administered and CAM was reduced to 400mg/day. PET/CT scan carried out in mid-October, 2013 showed CR (Figure 3). Since RA symptoms almost disappeared after finishing semi-pulse therapy, PSL was reduced to 5mg/day. The patient was discharged on October 31, 2013. Treatment with CAM (400 mg/day, 200 mg twice a day) coupled with lowdose PSL (5mg/day) was safely carried out without other antirheumatic drugs. Figure 3: Imaging tests results. The coronal PET image examined during the relapse (left) shows wide spread pathological uptake of radiotracer (FDG) in supraclavicular, mediastinal, hilar, peri-pancreatic, para-aortic, iliac, iliac and inguinal lymph nodes and left eight rib. The coronal PET image during CR (right) shows complete resolution of the FDG activity seen in relapse. Figure 4: Histology/immuno-histology of the subcutaneous lymph node biopsied during the relapse. (A) HE staining showing infiltration of H-RS cells in the background of lymphocytes (under ×40 magnification objective). (B, C & D) Immunohistochemical stainings for CD30 and LMP-1 and EBER staining (ISH) (under ×40 magnification objective). H-RS cells are positive for CD30, LMP-1 and EBER. (E, F, G & H) Immunohistochemical staining for CD4, CD8, CD20 and Ki-67 (under ×40 magnification objective). (E) Most of the lymphocytes in the background are positive for CD4. (F & G) CD-8-positive and CD-20-positive lymphocytes are occasionally present in the background. (H) H-RS cells and some of the lymphocytes are positive for Ki-67, showing proliferative activity. In the present case, circulating Th1, Th2 and pro-inflammatory cytokines, chemokine and interferon (IFN) including interleukin (IL)-1α, IL-1β, IL-2, IL-4, IL-5, IL-6, IL-8, IL-10, IL-12, tumor necrosis factor (TNF)-α, TNF-β, transforming growth factor (TGF)-β and IFN-γ were examined on 6 occasions during the course of illness, and compared with clinical parameters for RA (Table 1). In addition, the parameters for HL, RA and EBV infection were also compared with clinical symptoms (Figures 1 and 2). Clinical parameters for EBV, RA and HL and circulating cytokines showed elevated levels of s-IL-2R, IL-1β, IL-6 and TNF-α in initial phase of the disease as well as in relapse phase but returned to normal in CR phase. Copies of EBV-DNA in circulating lymphocytes were increased in relapse phase but returned to normal in CR. After semi-pulse therapy, levels of RAPA became tentatively negative, but it gradually increased up to ×320, and remained in elevated levels around ×160 in CR phase. Although RAPA levels remained elevated, RA symptoms almost subsided. Copies of EBV-DNA in circulating lymphocytes were increased in relapse phase and decreased to normal range in CR phase (Figure 2). NK-activity was within normal limits in CR phase (not shown). ↑, slight increase; ↑ ↑, apparent increase. Abbreviations: Ad, admission; anti-CCP, anti-cyclincitrullinated peptide antibody; CAM, clarithromycin; CR, complete remission; IFN, interferon; IL, interleukin; mo, month; MMP, matrix metalloproteinase; PSL, prednisolone; TGF, transforming growth factor; TNF, tumor necrosis factor; RA, rheumatoid arthritis; RAPA, RA particle agglutination; wk, week. Table 1: Levels of cytokines and RA parameters during the clinical course. The relative risk of developing lymphoma in patients with RA or rheumatologic diseases is estimated to be 2.0 to 5.5 times higher than the general population [1,2,19]. Although the pathogenesis of RA-related lymphomas is still unclear, high inflammatory activity of rheumatologic disease, immunosuppressive agents such as MTX, cyclosporine, infliximab, etanercept, adalimumab, tocilizmab and abatacept for RA, or EBV infection/reactivation have been speculated to be the cause . MTX is regarded as an effective immunosuppressive agent for treating autoimmune diseases, especially RA , but its long-term use can lead to severe immunodeficiency during the course of the illness. The fact that spontaneous remissions or regressions occur in MTX-related LPDs after withdrawal of MTX highlights a likely causative role of this drug in developing LPDs . However, in the present case, a relapse occurred without MTX, indicating MTX is not a direct causative agent. It is well known that LPDs occasionally develop in individuals with immunodeficiencies. According to the recent World Health Organization (WHO) classification for lymphoid neoplasms , immunosuppressive conditions prior to LPDs are categorized into (1) primary immune disorders, (2) human immunodeficiency virus infection, (3) iatrogenic immunosuppression in patients receiving solid organ or bone marrow allografts, i.e., post-transplant LPDs and (4) other iatrogenic immunodeficiency-associated LPDs. According to Hoshida et al. , the EBV-positive rate in post-transplant LPDs was described to be 63-95%, whereas that in sporadic LPDs in Western countries, it was only 5%. It is noteworthy that approximately 50% of MTX-related LPDs are EBV-positive . Thus, immunodeficiency itself is presumed to provide a basis for the development of some malignant lymphomas, probably through EBV infection/reactivation . However, it is also true that there are some EBV-negative lymphomas which regressed after withdrawal of MTX [5,6]. HL is an unusual proliferative disorder in which the malignant population of H-RS cells constitutes only a minority of the tumor mass, with the remainder being made up of apparently normal (activated) lymphocytes, plasma cells, histiocytes, granulocytes and fibroblasts . Thus, enlarged lymph nodes/lymphoid organs in HL do not represent true tumor mass in volume, but represent increased proliferated reactive cells together with H-RS cells. In the present case, the biopsied lymph node consisted of abundant CD-4, CD8 and CD20 lymphocytes with CD-4-positive cells being the most dominant (Figure 4). It is well known that HL is a cytokine secreting tumor . Probably, H-RS cells seem to express and secrete a variety of cytokines (i.e., IL-1, IL-2, IL-3, IL-4, IL-5, IL-6, IL-7, IL-9, IL-10, IL-12, IL-13, IL-15, ,IFN-γ, TGF-β, TNF- α/-β, basic fibroblast growth factor, GM-CSF and their receptors (i.e., IL-2R, IL-6R and TNF-αR) [26,27]. H-RS cells can receive signals via cytokine receptors in autocrine, paracrine or endocrine loops and exert a strong influence on the large number of surrounding reactive cells via cytokines. Thus, it is likely that characteristic histological features of HL reflect cytokine production by neoplastic tumor cells . In this context, the suppression of relevant cytokines secreted from H-RS cells by certain cytokine modulators can easily lead to regression of tumors. In the present case, initial immunophenotype of neoplastic cells seen in the first biopsied lymph node was positive for LMP-1, CD20, CD30 and negative for CD15 , but that of neoplastic cells seen in the lymph node in relapse phase became negative for CD20. This suggests that a somewhat different clonal change had occurred prior to or during the relapse phase, resulting in the relapse. RA is a chronic inflammatory disease of unknown cause, and EBV has been long suggested as a causative agent. RA patients have higher frequency and/or higher levels of antibodies to EBV in the serum than normal individuals. It is interesting to note that rheumatoid factors can induce signaling from B-cells, leading to EBV and B-cell activation . Patients with RA are known to have a T-lymphocyte defect which allows EBV-infected B-cells to survive . It has been reported that the number of circulating B-cells infected with EBV is increased in RA . In fact, copies of EBV-DNA in circulating lymphocytes were apparently increased in relapse phase, suggesting a close relationship between active EBV infection and development of HL. In the present case, levels of RAPA and anti-CCP antibody were increased in relapse phase as well as in initial phase of the disease; however, these parameters were also elevated in CR phase (Figures 1 and 2). The distinct parametric relationship between the severity of RA and development of HL needs to be confirmed. In the present case, neoplastic cells were positive for LMP- 1 and EBERs. As for the function of LMP-1, it is known to be essential for the immortalization of human B-cells. Kilger et al. demonstrated that continuous expression of LMP-1 is essential for the proliferation of EBV-immortalized B-cells in vitro; LMP- 1 binds TNF-receptor-associated factors, activates NF-κB, and triggers the transcription factor, i.e., activated protein-1, leading to proliferation of B-cells . EBERs are non-polyadenylated, untranslated RNAs, and exist most abundantly in latently EBVinfected cells. It was reported that 79% of HL are positive for EBERs . EBERs are known to make complexes with several cellular proteins such as protein kinase R, ribosomal protein L22, and La antigen. Thus, EBERs may exert various biological effects through their direct interaction with these cellular proteins (2, 17, 22). Moreover, EBERs can induce the expression of various cellular cytokines; IL-10 in B-lymphocytes, IL-9 in T-lymphocytes, and insulin-like growth factor-1 in epithelial cells, each of which acts as an autocrine growth factor . However, the mechanism of EBV involvement in developing HL still remains unknown. CAM, a member of macrolide family, is well known as an antibiotic but also have other important pharmacological properties . Thus far, many investigators have reported its immunosuppressive or immunomodulatory effects with respect to cytokines and chemokines in patients with cancer. Briefly, CAM can decrease the production of IL-1 [9,13,15,17,33,34], IL-2, [15,34-36], IL-5 [15,34], IL-6 [9,10,15,17,34,35-38], IL-8 [9,10,15,34,39], IL-10 [15,35,40,41], TNF-α [9,15,17,34,35,37,38,41], TGF-α [9,15], TGF-β [15,42], granulocyte colony-stimulating factor (G-CSF) , granulocyte macrophage colony-stimulating factor (GM-CSF) , vascular adhesion molecule-1  and MMP-9 [15,42], and increase the production of IL-4 [15,34,38] , IL-12 [15,38,40,41] and IFN-γ [38,40,41]. In addition, CAM has been reported to induce apoptosis [11-13]. Recently, Nakamura et al. reported that CAM can attenuate autophagy in multiple myeloma cells, leading to cell death . Furthermore, steroid-enhancing/ steroid-sparing effect of CAM has been reported [14,15]. Fost et al. demonstrated that administration of CAM with methyl PSL (m-PSL) to 6 adult patients with mild to moderate asthma resulted in a 65% reduction of m-PSL clearance and significantly higher mean plasma m-PSL concentrations compared with preCAM concentrations. In the present case, it is likely that CAM enhanced the effect of PSL for controlling RA. In our case, elevated levels of IL-1β, IL-6 and TNF-α were observed in relapse phase as well as in initial phase of the disease, but returned to normal range in CR phase. No increments of serum IL-1α,IL-2, IL-4, IL-5, IL-8, IL-10 and IL-12, IFN-γ, TGF-β were seen in relapse phase as well as in CR phase (Table 1). In connection with cytokines involvement in HL, Gause et al. tested the cytokine levels of IL-1β, IL-3, IL-6 GM-CSF, G-CSF and TNF-α in the sera of untreated patients with HL and demonstrated elevated levels of circulating IL-6 and GM-CSF. Frisan et al. reported that specific transcripts (mRNA) for IL-6, IL-10, TNF-α, TGF-β and IFN-γ were detected in biopsied samples from 5 EBV-positive and 3 EBV-negative HL cases. Merz et al. tested mRNA expression of IL-2, IL-3, IL-4, IL-6, GM-CSF and IFN-γ in lymph nodes obtained from untreated 13 cases of HL by using Northern blot analysis partly combined with ISH and detected mRNA of IL-3, IL-4, IL- 6, IFN-γ in varying frequency, particularly, IL-6 message being predominant in HL cases. In addition, IL-6 was detected in H-RS cells by ISH. IL-6 is a multifunctional proinflammatory cytokine that regulate the immune response, hematopoiesis, acute phase response and inflammation . IL-6 is known to activate STAT3 and thereby activates proliferative and anti-apoptotic pathways. Recently, Hinrichs et al. analyzed the plasma levels of IL-6 in 38 PTLDs undergoing chemotherapy for PTLD and demonstrated that pretherapeutic levels of IL-6 were elevated and their levels were correlated with the course of disease; falling in responders and rising in non-responders. TNF-α is also a multifunctional pro-inflammatory cytokine released mainly from macrophages, activated T-cells and NK-cells. Its primary role is regulation of immune cells. TNF-α, an endogenous pyrogen, can induce fever, apoptotic cell death, cachexia, inflammation, inhibit tumorigenesis and viral replication, and also respond to sepsis via IL-1-/IL-6-producing cells. TNF-α together with IL-6 and IL-1β is also known to be involved in pathogenesis of RA . IL-1 is a pro-inflammatory cytokine that play pleiotropic roles in host defense mechanisms. Two isoforms, namely, IL-1α and IL-1β, are present, and both have similar biological effects. H-RS cells are known to frequently express IL-1β as well as IL-1α, but IL- 1β being more frequent in expression than IL-1α . It is also known that circulating IL-1β are raised in patients with RA and correlated with clinical disease activity . In the present case, elevated serum levels of IL-1β, IL-6 and TNF-α were confirmed in initial phase as well as in relapse phase, and their levels returned to normal after achieving the first and second CRs. This finding might indicate that these cytokines are involved in developing lymphoma. In this context, it is interesting to note that CAM can decrease the production of IL-1, IL-6 and TNF-α. Thus, it is possible that CAM played an important role for regression of H-RS cells. However, IL-1β, IL-6 and TNF-α are also known to be increased in active RA . It is also possible that these elevated parameters are due to activated RA. However, it seems unlikely because these parameters were not increased when titers of RAPA and anti-CCP antibody, both representing RA activity, still remained high in CR phase. If the increase of these parameters (i.e., IL-β, IL-6 and TNF-α) was due to activated RA, they should also be increased even in CR phase in which RAPA and anti-CCP antibody remained high. As for the treatment of MTX-related EBV-associated LPDs, if the clinical situation permits, a period of observation for spontaneous remission after withdrawal of MTX is recommended [5,7,22,52]. Nevertheless, careful observation is required because the recurrence is common and may be treated successfully using standard chemotherapy . This may fit the present case. Concerning the optimal dose of CAM, Mikasa et al. reported that a dose of 400mg/day can be used as an adjuvant drug for cancer therapy with no remarkable adverse effects. Thus, we have applied the same dose of CAM without any side-effects. In the present case, the patient had RA which needs to be treated appropriately with immunosuppressive agents, but was concomitantly infected with EBV. The immunosuppressive treatment including PSL might have caused the reactivation of EBV which then led to development of EBV-associated HL. In other words, the use of PSL can be considered to be a double-edged sword. Considering steroid sparing/enhancing effect of CAM, we have applied low-dose PSL. It should be noted that, before initial presentation, the patient had been treated with PSL more than 10mg/day together with MTX, salazosulfapyridine, bucillamine and NSAIDs; nevertheless, RA could not be controlled by such anti-rheumatic drugs. The fact that RA could be controlled by low-dose PSL coupled with CAM seems to indicate that the effect of PSL, though small in dose, might have played sufficient effect for controlling RA due to steroid sparing/enhancing effect of CAM. The treatment applied in the present case is recommended in view of simplicity, safety and lesser cost. In conclusion, the present case provides helpful clues for understanding the mechanism whereby EBV-associated HL develop in RA patients, and also provides effective treatment for RA as well as HL. The clinical course showed that MTX itself has no direct effect on developing HL but rather caused reactivation of EBV, consequently resulting in HL. The authors would like to thank Prof. Hong-Kean Ooi (Department of Veterinary Medicine, Azabu University) in helpful reviewing and preparing the manuscript. Gridley G, McLaughlin JK, Ekbom A, Klareskog L, Adami HO et al. (1993) Incidence of cancer among patients with rheumatoid arthritis. Journal of National Cancer Institute85: 307-311. Mellemkjaer L, Linet MS, Gridley G, Frisch M, Moller H et al. (1996) Rheumatoid arthritis and cancer risk. European Journal of Cancer 32: 1753-1757. Ellman MH, Hurwitz H, Thomas C, Kozloff M (1991) Lymphoma developing in a patient with rheumatoid arthritis taking low dose weekly methotrexate. Journal of Rheumatology18: 1741-1743. Moder KG, Tefferi A, Cohen MD, Menke DM, Luthra HS (1995) Hematologic malignancies and the use of methotrexate in rheumatoid arthritis: a retrospective study. American Journal of Medicine99: 276-281. Salloum E, Cooper DL, Howe G, Lacy J, Tallini G,et al. (1996) Spontaneous regression of lymphoproliferative disorders in patients treated with methotrexate for rheumatoid arthritis and other rheumatic diseases. Journal of Clinical Oncology14: 1943-1949. Marriette X, Cazals-Hatem D, Warszawki J, Liote F, Balandraud N et al. (2002) Lymphomas in rheumatoid arthritis patients treated with methotrexate: a 3-year prospective study in France. Blood99: 3909-3915. Kamel OW (1997) Latrogeniclymphoproliferative disorders in nontransplantation settings. Seminars in Diagnostic Pathology 14: 27-34. Kamel OW, van de Rijn M, Weiss LM, delZoppo GJ, Hench PK et al. (1993) Brief report: reversible lymphomas associated with Epstein-Barr virus occurring during methotrexate therapy for rheumatoid arthritis and dermatomyositis. The New England Journal of Medicine 328: 1317-1321. Culic O, Eracovic V, Parnham MJ (2001) Anti-inflammatory effects of macrolide antibiotics. European Journal of Pharmacology429: 209-229. Kanoh S, Rubin BK (2010) Mechanisms of action and clinical application of macrolides as immunomodulatory medications. Clinical Microbiology Reviews 23: 590-615. Ishimatsu Y, Kadota J, Iwashita T, Nagata T, Ishii H et al. (2004) Macrolide antibiotics induce apoptosis of human peripheral lymphocytes in vitro. International Journal of Antimicrobial Agents24: 247-253. Mizunoe S, Kadota J, Tokimatsu I, Kishi K, Nagai H, et al. (2004) Clarithromycin and azithromycicn induce apoptosis of activated lymphocytes via down-regulation of Bcl-xL. International Immunopharmacology4: 1201-1207. Takemori N, Nakamura M, Kojima M, Eishi Y (2014) Successful treatment in a case of propionibacterium acnes-associated sarcoidosis with clarithromycin administration: a case report. Journal of Medical Case Reports8: 15. Fost DA, Leung DYM, Martin RJ, Brown EE, Szefler SJ, Spahn JJ (1999) Inhibition of methylprednisolone elimination in the presence of clarithromycin therapy. Journal of Allergy and Clinical Immunology103: 1031-1035. Takemori N, Fukuda T, Kojima M (2014) Follow-up study of a multiple myeloma patient successfully treated with clarithromycin (CAM), low-dose lenalidomide and low-dose dexamethasone: significance and possible mechanism of action of CAM as an Add-on therapy. Case Reports in Clinical Medicine 3: 674-684. Sauter C, Blum S (2003) Regression of lung lesions in Hodgkin’s disease by antibiotics. American Journal of Clinical Oncology 26: 92-94. Kamel OW, Weiss LM, van de Rijn M, Colby TV, Kingma DW, et al. (1996) Hodgkin’s disease and lymphoproliferations resembling Hodgkin’s disease in patients receiving long-term low dose methotrexate therapy. The American Journal of Surgical Pathology 20: 1279-1287. Thomas E, Brewster DH, Black RJ, MacFarlane GJ (2000) Risk of malignancy among patients with rheumatic conditions. International Journal of Cancer 88: 497-502. Miyazaki T, Fujimaki K, Shirasugi Y, Yoshiba F, Ohsaka M, et al. (2007) Remission of lymphoma after withdrawal of methotrexate in rheumatoid arthritis: relationship with type of latent Epstein-Barr virus infection. American Journal of Hematology 82: 1106-1109. Tishler M, Caspi D, Yaron M (1993) Long-term experience with low dose methotrexate in rheumatoid arthritis. Rheumatology International 13: 103-106. Georgescu L, Quinn GC, Schwaltzman S, Paget SA (1997) Lymphoma in patients with rheumatoid arthritis: association with the disease state or methotrexate treatment. Seminars in Arthritis and Rheumatism 26: 794-804. Swerdlow SH, Campo E, Harris NL, Jaffe ES, Pileri SA et al. (2008) WHO Classification of Tumours of Haematopoietic and Lymphoid Tissues.4th edition, Lyon, IARC Press. Hoshida Y, Tomita Y, Zhiming D, Yamauchi A, Nakatsuka S et al. (2004) Lymphoproliferative disorders in autoimmune diseases in Japan: analysis of clinicopathological features and Epstein-Barr virus infection. International Journal of Cancer 108:443-449. Diehl V, von Kalle C, Fonatsch C, Tesch H, Jüecker M, et al. (1990) The cell of origin in Hodgkin’s disease. Seminars in Oncology 17: 660-672. Drexler HG (1992) Recent results on the biology of Hodgkin and Reed-Sternberg cells. 1. Biopsy material. Leukemia and Lymphoma 8: 283-313. Ma Y, van den Berg A, Atayar C, Visser L, Poppema S (2007) Cytokines, cytokine receptors, and chemokines in Hodgkin lymphoma. In: Hodgkin lymphoma. 2nd edition, Hoppe RT,Mauch PT, Armitage JO, Diehl V, Weiss LM, Philadelphia, Lippincott, Williams and Wilkins. Yang L, Hakoda M, Iwabuchi K, Takeda T, Koike T et al. (2004) Rheumatoid factors induce signaling from B cells, leading to Epstein-Barr virus and B-cell activation. Journal of Virology 78: 9918-9923. Tosato G, Steinberg AD, Yarchoan R, Heilman CA, Pike SE et al. (1984) Abnormally elevated frequency of Epstein-Barr virus-infected B cells in the blood of patients with rheumatoid arthritis. The Journal of Clinical Investigation 73: 1789-1795. Kilger E, Kieser A, Baumann M, Hammerschmidt W (1998) Epstein-Barr virus-mediated B-cell proliferation is dependent upon latent membrane protein 1, which simulates an activated CD40 receptor. The EMBO Journal 17: 1700-1709. Makar RR, Saji T, Junaid TA (2003) Epstein-Barr virus expression in Hodgkin’s lymphoma in Kuwait. Pathology Oncology Research 9: 159-165. Yajima M, Kanda T, Takada K (2005) Critical role of Epstein-Barr virus (EBV)-encoded RNA in efficient EBV-induced B-lymphocyte growth transformation. Journal of Virology 79: 4298-4307. Takeshita K, Yamagishi I, Harada M, Otomo S, Nakagawa T, et al. (1989) Immunological and anti-inflammatory effects of clarithromycin: inhibition of interleukin 1 production of murine peritoneal macrophages. Drugs under Experimental and Clinical Research 15: 527-533.
van NuffelAMT, Sukhatme V, Pantziaka P, Meheus L, Sukhatme VP, et al. (2015) Repurposing drugs in oncology (ReDO)−clarithromycin as an anti-cancer agent. ecancer 9: 513. Morikawa K, Zhang J, Nonaka M, Morikawa S (2002) Modulatory effect of macrolide antibiotics on the Th1- and Th2-type cytokine production. International Journal of Antimicrobial Agents 19: 53-59. Sugiyama K, Shirai R, Mukae H, Ishimoto H, Nagata T et al. (2007) Differing effects of clarithromycin and azithromycin on cytokine production by murine dendritic cells. Clinical and Experimental Immunology 147: 540-546. Sakamoto M, Mikasa K, Hamada K, Teramoto S, Konishi M et al. (1996) Long-term clarithromycin treatment for cancer cachexia of inoperable non-small cell lung cancer patients. Japanese Journal of Chemotherapy 44: 879-882. Hamada K, Mikasa K, Yunou Y, Kurioka T, Majima T, et al. (2000) Adjuvant effect of clarithromycin on chemotherapy for murine lung cancer. Chemotherapy 46: 49-61. Kikuchi T, Hagiwara K, Honda Y, Gomi K, Kobayashi T, et al. (2002) Clarithromycin suppresses lipopolysaccharide-induced interleukin-8 production by human monocytes through AP-1 and NF-κB transcription factors. Journal of Antimicrobial Chemotherapy 49: 745-755. Majima T, Mikasa K, Hamada K, Konishi M, Maeda K et al. (1999) Changes of cytokine mRNA in peripheral blood mononuclear cells from unresecn non-small cell lung cancer patients before and after clarithromycin therapy. Japanese Journal of Chemotherapy 47: 345-348. Majima T, Mikasa K, Sakamoto M, Hamada K, Konishi M et al. (2000) Clarithromycin regulates cytokine mRNA in non-small cell lung cancer. Japanese Journal of Chemotherapy 48: 780-785. Sassa K, Mizushima Y, Kobayashi M (1999) Differential modulatory effects of clarithromycin on the production of cytokines by a tumor. Antimicrobial Agents and Chemotherapy 43: 2787-2789. Nakamura M, Kikukawa Y, Takeya M, Mitsuya H, Hata H (2010) Clarithromycin attenuates autophagy in myeloma cells. International Journal of Oncology 37: 815-820. Gause A, Keymis S, Scholz R, Schobert I, Jung W et al. (1992) Increased levels of circulating cytokines in patients with untreated Hodgkin’s disease. Lymphokine Cytokine Research 11: 109. Frisan T, Sjoberg J, Dolcetti R, Boiocchi M, de Re V et al. (1995) Local suppression of Epstein-Barr virus (EBV)-specific cytotoxicity in biopsies of EBV-positive Hodgkin’s disease. Blood 86: 1493-1501. Merz H, Fliedner A, Orscheschek K, Binder Th, Sebald W et al. (1991) Cytokine expression in T-cell lymphomas and Hodgkin’s disease: Its possible implication in autocrine or paracrine production as a potential basis for neoplastic growth. American Journal of Pathology 139: 1173-1180. Burger R (2013) Impact of interleukin-6 in hematological malignancies. Transfusion Medicine and Hemotherapy 40: 336-343. Hinrichs C, Wendland S, Zimmermann H, Eurich D, Neuhaus R et al. (2011) IL-6 and IL-10 in post-transplant lymphoproliferative disorders development and maintenance: a longitudinal study of cytokine plasma levels and T-cell subsets in 38 patients undergoing treatment. Transplant International 24: 892-903. Choy E (2012) Understanding the dynamics: pathways involved in the pathogenesis of rheumatoid arthritis. Rheumatology 51: 3-11. Umemiya T, Furukawa R, Azuma K, Higashi M, Mikata A (1997)Cytokine expression in Hodgkin’s disease and non-Hodgkin’s lymphoma tissues. The Journal of the Japanese Society of LymphoreticularTissue 37: 189-198. Eastgate JA, Symons JA, Wood NC, Grinlinton FM, Giovine FS, et al. (1988) Correlation of plasma interleukin 1 levels with disease activity inrheumatoid arthritis. Lancet 2: 706-709. Jardine DL, Colls BM (2002) Hodgkin’s disease following methotrexate therapy for rheumatoid arthritis. The New Zealand Medical Journal 115: 293-294. Mikasa K, Sawaki M, Kita E, Hamada K, Teramoto S et al. (1997)Significant survival benefit to patients with advanced non-small-cell lung cancer from treatment with clarithromycin. Chemotherapy 43: 288-296.